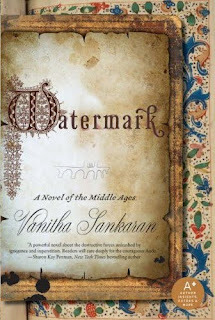 Vanitha Sankaran's debut novel is the story of a papermaker's daughter in 1300's Narbonne, France. Heretic fever is at its height, with the church inspectors ready to question and torture those suspected of undermining the church and its teachings. Neighbouring Carcassonne is suffering the heretic fires, and many in Narbonne fear the inevitable arrival of the inquisitors. disciple of the devil or a witch, so Auda, the twenty-year-old heroine is under threat, for she is certainly different. Born an albino, Auda cannot speak with her own voice, but uses a primitive form of signing to communicate with her father, Martin and sister, Poncia the only two people who try to protect Auda from the prejudices of so called friends and strangers. Without speech, Auda is a compelling heroine and shows the reader the world through her eyes and thoughts. Normal life, love, marriage and a family are not what Auda sees for herself, and her yearning for another pathway for herself proves her downfall. Taken in as a scribe to the Vicomtesse for her protection, Auda is the focus of attention when her poetic soul finds an outlet in the written word about the quality of love. But her verses are subject to misinterpretation by others as well as the church. Even a gift Auda has made for her father becomes a weapon that is ultimately used against her. There is one man who sees Auda's inner self. Jaime, an artist, is prepared to take a risk to be with her. Ms Sankaran has painted a colorful picture of a Fourteenth Century French town with all its seething and primitive life, together with an inherent terror of the church’s powers. Her research is exemplary and includes some fascinating details of the papermakers' art. Auda is an unusual heroine, but one who will stay with you long after the final, savage chapters of her remarkable story. im hearing good things about this book - one for the tbr list i think! I was at the LA Book Festival yesterday and met this author-I have done some research on the book and it is going on my list. She was a pleasure to talk to. The Yellow House arrived. Thank you.